This piece was published at Inc. magazine. It is part of a weekly series created by Springboard Enterprises alumnae, called “Been There, Run That.” This was the kick-off post, that I wrote on a long car ride. As a CEO, you sign a high-pressure contract with your customers, investors and employees to solemnly swear to be faster, better, smarter than the next guy or gal. Unless you possess superpowers, it’s impossible. You can’t do this all on your own. So imagine your company as a bunch of auto parts. As CEO, you hope to soon be at the wheel of a lean, mean driving machine. You don’t personally need to know how to assemble the seats, the engine, and the tires. But you do need to find people can to put the parts together so you can get on the road, fast. This is where advisors come in handy. Keep the load light. 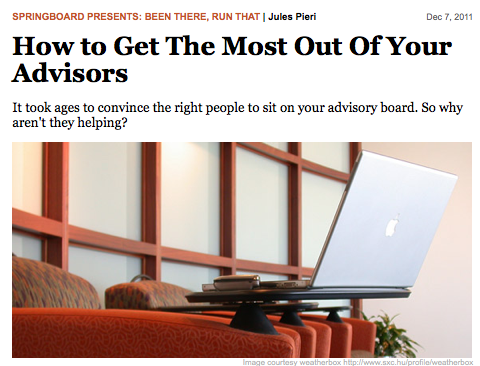 Keep the number of active advisors in your company between three and six. Why? It’s basic human psychology. Did you ever get an email asking for help, and then notice it that it was sent to fifteen people? Most people don’t respond to such things, because they assume that one of the other fourteen people answered. The same is true of advisors. They need to feel needed before they’ll extend themselves. Don’t be afraid to drop advisors along the way. The skills you need from your advisors in the first years of your company will be radically different from what you need later on. Veteran advisors understand this. Manage expectations by using a formal agreement with equity compensation reviewed annually. Specify the expected time commitment and grant equity that assumes a year’s involvement. In an early stage company, one year’s involvement will be worth somewhere between ¼ and 1% of the equity in the company. Do a lot of test driving before putting people on the road with you. What can seem like a burning need right now might be a distant memory six months later. Conversely, an advisor can be extremely enthusiastic for two months and then fade away, thanks to other demands and pressures in their life. You are looking for advisors who can consistently and quickly answer your calls, and who have enough depth and coverage to merit a seat in the car. In addition to forming a great advisory board, consider joining a community of peer advisors. You’ll get immediate help, you may find candidates for your advisory board, and you’ll practice the art of giving and taking advice, which will benefit you in multiple ways. To find great peers, I’ve had good luck with the Creative Good Councils, a peer network of digital executives across a wide range of industries and geographies. They’ve announced a free membership for qualified candidates. I’ve been a member for several years and it’s been very helpful. Because there is careful vetting of applications to ensure that only senior-level talent is admitted, the quality of participants is high. Just as driving from coast to coast is an intense and exhilarating process, with unexpected weather, boring interludes, and breathtaking scenery, so goes the journey of building a business. You wouldn’t invite just anyone along on that road trip, but it sure would be lonely doing it alone. Find some trusted advisors to take along for the ride.